ASA KEYES, 28th district attorney of Los Angeles County, entered office on June 6, 1923. He gained the post because the DA who was exiting for health reasons, Thomas Lee Woolwine, had twisted supervisors’ arms to appoint Keyes, his trusted chief deputy. Keyes won the office at the polls in 1924, faced with only token opposition (by a Police Court judge). His term ended Dec. 3, 1928, when his elected successor, Buron Fitts, took over. In this period of roughly 5½ years, Keyes had gone from a skilled prosecutor, known for his honesty, and with a seeming future in politics, to a hobnobber with hoods, a lush, and a criminal defendant charged with taking bribes. These were the days of Prohibition. Graft was rampant, just behind vice, often linked to it. Crooked politicians were hardly anomalies. But if there had ever before that time been a crooked Los Angeles district attorney, the facts of such corruption have never come to light. A prosecution was brought against principals in that corporation. The 1928 prosecution failed; the trial judge publicly denounced Keyes for, in effect, throwing the match; hard evidence emerged that Keyes had accepted bribes to cause the acquittals. This is the same Keyes who, in an Aug. 25, 1924 ad in local newspapers, placed by a local businessman, is hailed as “the ‘squarest District Attorney’ that ever held that office.” The entrepreneur adds: “I don’t believe ‘ten million dollars’ in his lap would make him violate his oath of office.” An ad the next day proclaims that Keyes enjoyed “a reputation for honesty…that no man would dare to question.” The advertiser was C.C. Julian, head of the petroleum company bearing his name. Oddly enough, Julian did not come to be charged in connection with the mega-scam. 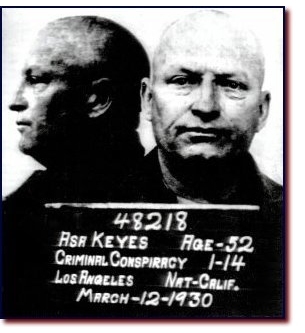 On Feb. 8, 1929, a jury convicted Keyes and two co-conspirators on all counts. How many other bribes had Keyes taken? No others were proven, but…. •It was widely suspected that a payoff had induced his decision in January, 1927, to drop the prosecution of evangelist Aimee Semple McPherson for fabricating evidence. From his hospital bed at the County Jail where he was awaiting action on his appeal, Keyes issued a statement questioning why Richardson, if he had concrete evidence, had waited three years before making public mention of it. Keyes had contended that his ill health mandated his release on bail pending resolution of the appeal. The Court of Appeal, on Aug. 14, 1929, rejected his motion. Although Keyes had bolstered his contention with the affidavits of five physicians and one dentist, the appeals court, in a 2-0 opinion (with one justice not participating), held that “an immediately imminent danger to appellant’s material well-being” had not been shown. The ex-DA was transported to state prison. “In the five years he was District Attorney of Los Angeles Asa Keyes (pronounced Kize)…sent 4,030 men and women to California prisons for every variety of crime. Last week he joined this criminal company himself, entered San Quentin Prison as a convicted bribe-taker, a betrayer of public trust. The 1930 census shows him to have been a clerk in a lieutenant’s office. The former DA termed San Quentin “California’s training school for crimes,” a report in the Los Angeles Times says. Keyes was later to write to Gov. James Rolph urging that Selby, who killed his girlfriend, be pardoned, and also prepared an appeal to the governor that the sentence of an inmate who was scheduled to be hanged be commuted to life imprisonment. Both efforts failed. Keyes had been sentenced to an indeterminate term of one to 14 years in prison. The parole date was to be set by the state Prison Board. The inmate petitioned for release after one year. The backlogged board did not get to his application for a few months. On July 12, it set Keyes’ term at five years, the last two years to be spent on parole. With credits for good behavior, he was to be released in roughly three months. On Oct. 13, 1931, Keyes left San Quentin. He had lined up a job in Los Angeles as a car salesman. The former DA could not practice law unless his civil disabilities were removed through a pardon by the governor—which Keyes had sought, and which wasn’t forthcoming—and until the California Supreme Court acted to readmit him. Keyes could not make a go of it as a car salesman. Nor as general manager of a bail bond company. He had, however, been proficient as a lawyer. There was wide support for a parole in order to render Keyes eligible for State Bar reinstatement. District Attorney Buron Fitts, who prosecuted him, the judge who presided at his trial, the state’s chief justice, even the Times, backed the effort. On Aug. 19, 1933, Rolph issued a pardon. Prominent attorney Joseph Scott represented Keyes before the State Bar Board of Governors seeking its recommendation to the Supreme Court to reinsert the ex-prosecutor’s name on the roll of attorneys. But on Jan. 20, 1934, the board found, according to an Associated Press dispatch, that he “had not sufficiently rehabilitated himself in the eyes of the public to warrant” readmission. That effectively killed the bid for the time being. Keyes could reapply in two years. But he didn’t live that long. “Asa Keyes, 57, veteran Los Angeles district attorney who prosecuted some of the nation’s most famous criminal cases, and who was himself sent to prison as a convicted bribe-taker, died of a paralytic stroke today. “Keyes had been practicing law ever since he got out of San Quentin. “You see when Keyes was Los Angeles’ district attorney he was very sympathetic to Hollywood’s problems. After he was released from the penitentiary, Hollywood sought to give him a helping hand. He began an automobile salesman and the stars, headed by Lew Cody, bought his cars. Next time: a look at Fitts, a DA who was indicted, who unsuccessfully sought the governorship, who eventually committed suicide.